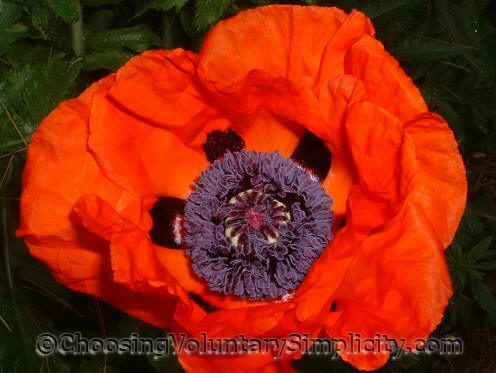 The Oriental Poppy (Papaver orientale) is an old-fashioned perennial that flourishes in a sunny location. The foliage is medium green, hairy, and fern-like, and the brilliant scarlet orange flowers really stand out. Often each flower can be up to ten inches across and the black center combined with the bright scarlet orange flowers is amazingly beautiful. Oriental Poppies can be propagated by root cuttings or by dividing mature plants in the fall. Poppies will wilt miserably if they are transplanted during warm weather. New plants can also be started by seeds taken from the seed pods as soon as the seeds ripen and the pods start to open. Or you can do what I do and let the poppies seed themselves! My poppies, all from the same seed source, are different shades of scarlet and orange, depending on how much sun they get. Look at that picture! Wonderful! This is an old favorite of mine. I took some seed from a neighbor’s garden and started all the poppies I have now, which is a fairly big area. They are such a bright spot of color when they are in bloom. Good post.